Human verification* What is 2 + 7? The driving force behind Topclass Driving School. 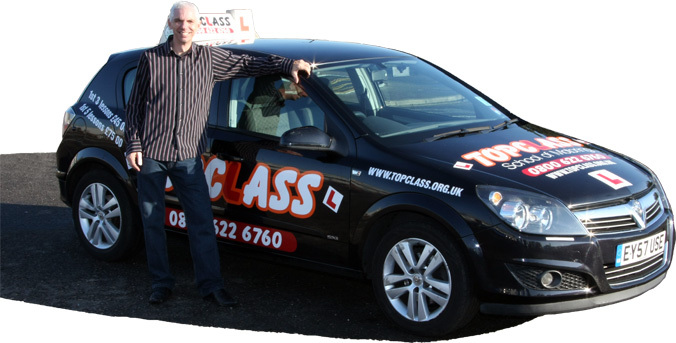 Tim's eighteen years experience and broad knowledge as a Grade 6 DSA Approved Driving Instructor, enable him to provide informative and productive driving lessons in a calm and relaxing atmosphere, believing driving should be fun, Tim's relaxed but safe approach is ideal for the more nervous or mature driver. Tim is based in Gillingham but also covers the Medway, Sittingbourne, Sheerness, Gravesend and surrounding areas of Kent. Tim offers driving lessons both in manual and automatic cars in the above areas and with a flexible approach on lesson times can cater for his pupils with a variety of lesson times to suit. So whether it's an early start, late evening or weekend, Tim can meet your requirements. Tim teaches complete beginners right through to pass plus refresher and motorway lessons for full licence holders. So whether it's a 1 or 2 hour lesson, to a 40 hour intensive course he can cater for your needs. Tim is patient and understanding and conducts his lessons in a professional and expert manner. He is also a member of the Driving instructors Association.